Ruf-Nec Tackle opened it's doors at Ute Lake in the Spring of 2002. It has always been our goal to help you make your visit to Ute Lake an enjoyable experience. We provide up to date fishing report here on our site that is updated weekly. We are open about 360 days a year, so you don't have to plan your trip around hoping you can find a bait and tackle store open. We are located on the Lake road, and we are the closet store to the Ute Creek launch ramps. At the store we offer live bait and tackle, snacks, and soft drinks. We will always try to help you with the latest information on where they are biting and what they are biting on. We offer baits that are custom made with Ute Lake in mind. You won't find these anywhere else, so stop in and take a look. 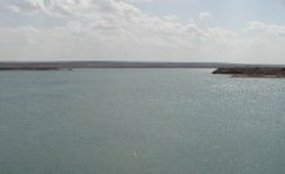 If you have an event at UTE LAKE, let us know and we will put it up on our site so people can check it out. Feel free to call anytime for information. 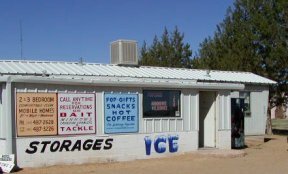 When you arrive, if you need bait, tackle, or information, call (575)487-2628. Ruf-Nec Tackle - LIVE BAIT, GREAT SELECTION OF TACKLE FOR BASS, WALLEYE, CRAPPIE AND WHITE BASS. CUSTOM TACKLE AVAILABLE.